Though a string of kings, coups, and dictators had thrown mid-nineteenth century France into instability, many in the upper echelons continued to lead a gilded life. Indeed, the entitlement of the “haute-bourgeoisie,” the class of wealthy merchants and bankers, only increased under King Louis-Philippe. Bred by a culture of discontent with excess materialism, a group of poets (including Charles Baudelaire, Paul Verlaine, and Stéphane Mallarmé) began to write elegant, darkly mysterious verse. Their work tried to make sense of a shift from an agricultural to an industrial economy, from a rural to an urban landscape; in short, from the classical to the modern era. Whereas much literature of the previous generation tried to draw bright moral lines, or strive toward the height of humanity, Symbolist work dwelt in a world of moral complexity, with a propensity toward vice. Essentially, the gold of the Enlightenment became tarnished by smoky plumes from factory chimneys and back-alley opium dens. Originally a stock character in the 16th century Italian commedia dell’arte, then known as Pedrolino, Pierrot is perhaps one of the better known characters from this art form. The original “sad clown,” he could be involved in both comic and romantic plots, either with boisterous energy or swooning mien. Pierrot pined after Columbina, who preferred the affections of the rascal Arlecchino (Harlequin). He spoke with a higher voice and more swooping gesture than Arlecchino, another Zanni character. Adapted by the French, he became more mystical and moony, playing the harp and pining away. 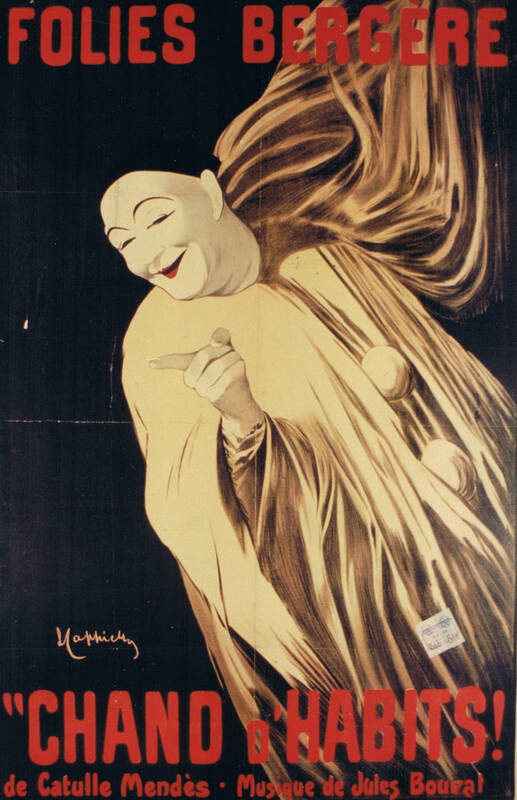 Even philosophers started adopting Pierrot as a poster child; at one point, Pierrot embodied the struggle of post-revolution France struggling to secure a place in the bourgeois world. Symbolists saw him as an emblem of suffering, with only the moon for a friend. Naturally, as Pierrot’s association with the moon (and thus, the night) deepened, it was easy to emphasize his darker qualities; eventually artists gave him a literally bleeding heart, as in Leo Rauth’s works “Liebesschwur (Oath of Love)” and “Ein gern gesehener Gast (A Well-Received Guest).” Since his sadness often caused his words to fail him, Pierrot is seen as the father of mime. Read more in this great piece on Pierrot’s transformations through the ages and artistic disciplines.